This recipe is part of this year's Holiday Treat Extravaganza! To see all the recipes, click on the page tab of the same name located at the top of the blog. To submit a recipe or a request, send a message to celiacbaby@hotmail.com. I found a cake pop pan one day without really looking for it, and bought it on a whim. It's not one of the fancy electric ones, it's one that goes in the oven like a muffin tin. The tin came with 12 cake pop sticks, but the batter makes more than 12, so buy some additional sticks at a store that sells bake ware, like a Michael's or a Bulk Barn. I prefer these to the "make a cake, smash and mix with icing" method because they're not as sweet and wet, and they are uniform in size. **Most cake pop recipes call for using half the amount of liquid called for in the recipe, but I found that with gluten free mixes, the pops come out too dry if I cut the liquid in half. I keep the original proportions. 1- Mix all ingredients in a large bowl and beat according to cake mix instructions. 2- Spoon batter into bottom half of cake pop pans, not quite to the fill line. Put on lid and attach fastening clips. Bake in a 350F oven for approx. 15 minutes. Check that they're done by poking a toothpick through the hole at the top. When it comes out clean, they're done. 4- Allow pans to cool before removing lid. Don't worry about any batter that has puffed through the holes at the top. Loosen pops around the edges with a plastic knife. 5- Melt a small amount of coating (chocolate or candy melts) and dip sticks in them. 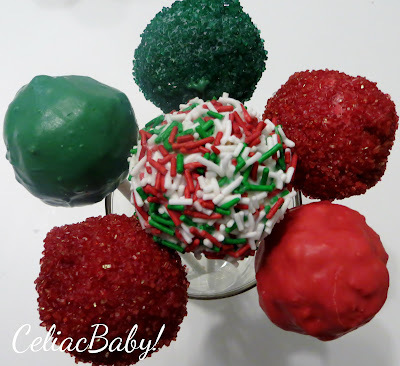 Push into cake pops and then place in freezer for a few minutes to harden. While the pops are in the freezer, prepare decorations. You will need approx. 2-3 cups of melted chocolate or candy melt to coat the pops, or you could use 1 container of regular frosting. When they come out of the freezer, I remove them from the tin and put another batch in the oven while I'm decorating. 1- Melt coating in a glass or ceramic bowl and set aside. 2- Lay out sprinkles, coloured sugar, or other decorations that will be used to coat the pops. Set up a cake pop drying stand. Cheap ones can be purchased at baking supply places or you can make your own using the hard foam used for flower arranging. 3- Remove the pops from the freezer. Take a cake pop out of the tin, and brush off any crumbs. This will make the coating adhere more evenly. 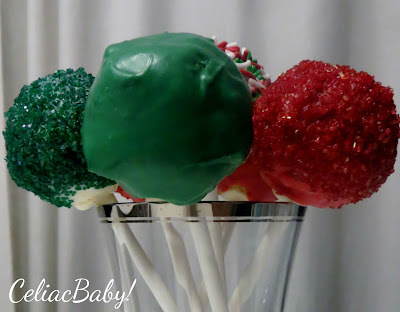 Coat the pop with the melted candy, and allow excess to drip off before rolling it in any additional decorations. 4-Stand in drying stand and allow to harden. Best stored in the refrigerator of they are not going to be eaten within one or two days. Place in sealable freezer bags in a single layer.